As Democrats celebrated the U.S. Supreme Court's ruling on Thursday that saved President Barack Obama's sweeping healthcare overhaul, the mood inside the White House was a subdued satisfaction. The survival of the law - dubbed "Obamacare" by critics - preserves one of the Republicans' favorite tools for bashing the president as he vies for re-election on November 6 against Mitt Romney, who vowed again on Thursday to press for the repeal of the measure if he is elected. Polls suggest that Republicans have won the public relations battle over the 2010 law. A majority of Americans say they oppose the law, but when asked about many of its provisions, most support them. Republicans said Romney will make attacks on the law - and especially the individual mandate - a feature of his campaign. Opposition to the law helped inspire victories for Republicans in the 2010 congressional elections when they won a majority in the House of Representatives and statehouses across the country. "This is a weapon that Romney can certainly use if he spins it the right way," Republican strategist Ford O'Connell said. "He can say, 'If you want this law repealed, I am literally your last option.'" More Americans think Supreme Court justices will be acting mainly on their partisan political views than on a neutral reading of the law when they decide the constitutionality of President Obama’s health-care law, according to a new Washington Post-ABC News poll. Half of the public expects the justices to rule mainly based on their “partisan political views,” while fewer, 40 percent, expect their decisions to be rooted primarily “on the basis of the law.” The rest say both equally or do not have an opinion. No one will know until June how the Supreme Court will rule on President Obama's Affordable Care Act. What we do know is there are three possible outcomes -- the law is upheld, struck down or struck down in part -- and Republicans must be prepared for each. If the law, also known as "ObamaCare," is struck down -- in whole or in part -- and the GOP is not prepared, it could find itself on the losing end of a vicious battle that could lead to four more years of Democratic control of the White House and perhaps Congress as well. For most Americans, health care is like plumbing: They know they need it; they don't truly know how it works, but they definitely know when it's not working. And they sense now health care is not working, and the health care law -- flawed though it may be -- represents a legitimate attempt to fix it. There is no doubt health care will remain a highly volatile issue in this election year. If ObamaCare is rejected by the court, it would present a huge opportunity for Republicans. They could look like problem-solvers by coming up with a smart proposal that takes the best ideas from the other side. And if they can message it properly, they'll be in a sweet spot. The thick black line in the center of the chart, however, is the important one. This line represents the median justice, currently Justice Anthony M. Kennedy, whose vote would ordinarily be decisive in a 5-to-4 decision. The conventional wisdom is that it would be a political disaster for Democratic President Barack Obama, and a boon for Republicans, if the U.S. Supreme Court strikes down all or most of Obama's healthcare overhaul. That could be: The healthcare law - which among other things would require most Americans to buy health insurance - is Obama's signature achievement in domestic policy, and the number-one target of many Republicans in this year's elections. However, that doesn't necessarily mean a loss before the Supreme Court would cripple Obama's re-election argument in November. In fact, some political analysts believe that if the court strikes down the law, it would make it easier for Obama to cast Republicans in Washington -- including conservatives in the Supreme Court -- as obstructionists who have worked against the interests of middle- and low-income Americans. Several parts of the healthcare plan are very popular, including a measure barring insurance companies from refusing to cover people with pre-existing medical conditions or charging far more for coverage of those who are sick. Without "Obamacare" to rally them into action, it is unclear whether some conservatives would remain as passionate about the 2012 elections, analysts say. "If this whole thing gets overturned, they could certainly lose some momentum," said Republican strategist Ford O'Connell, adding that Republicans would need to come up with an alternative, free-market healthcare plan to avoid losing the interest of some Tea Party conservatives. "If it gets overturned, (Republicans) are in for a knock-down, drag-out fight" in the November elections, "because ... it is going to fire up progressives," O'Connell said. The Supreme Court spent 91 minutes Wednesday operating on the assumption that it would strike down the key feature of the new health care law, but may have convinced itself in the end not to do that because of just how hard it would be to decide what to do after that. A common reaction, across the bench, was that the Justices themselves did not want the onerous task of going through the remainder of the entire 2,700 pages of the law and deciding what to keep and what to throw out, and most seemed to think that should be left to Congress. They could not come together, however, on just what task they would send across the street for the lawmakers to perform. The net effect may well have shored up support for the individual insurance mandate itself. What's At Stake In Supreme Court Oral Arguments, RE: Obamacare? In taking up President Barack Obama's health overhaul Monday, the Supreme Court wades into an issue that not only could sway this fall's elections but also could help define for generations what Congress is and isn't entitled to do. To win, the challengers must secure all five conservatives. Based on his prior opinions, Justice Clarence Thomas seems virtually certain to vote against the mandate. The records of the other four, however, are sufficiently ambiguous as to make their votes more difficult to predict. 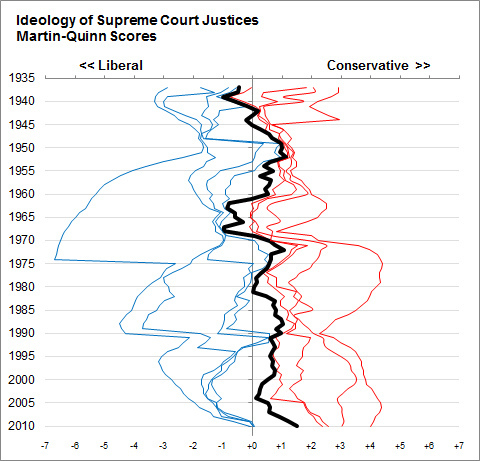 Of the justices considered persuadable, Justice Anthony Kennedy may be the biggest target, as his opinions were cited in the two sides' briefs far more than those of any other justice. The court also could punt. One federal appeals court, the Fourth Circuit, in Richmond, Va., ruled that a challenge can only take place in 2014 or after, when those penalized under the law's insurance mandate actually have to pay their penalties.